The new 2018 Nissan Armada raises the bar in its automobile class. It is an SUV with several different options which all come together to make it a very versatile vehicle. The Armada showcases a great amount of towing capabilities to go along with an all-wheel-drive system. 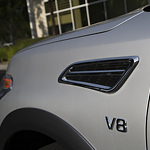 The 2018 Nissan Armada is powered by its 5.6 direct injection gasoline V8 engine which is rated at 390 horsepower. The engine provides 394 pounds-foot torque, which lends to a massive towing capacity of 8500 lbs. The Armada has decent fuel economy despite the powerful engine due to its unique engine modifications. It allows for the vehicle to demonstrate great power without overusing gasoline. The 7-speed automatic transmission is available with adaptive controls and downshifting. It provides the driver with great handling over the vehicle. The Armada is equipped to take on all sorts of weather. It adapts to rainy surfaces and is serviceable on the off road. Stop in at Lithia Nissan of Fresno and schedule a test drive with the 2018 Nissan Armada today.